The Rt. Rev. J. Neil Alexander, dean of the School of Theology at the University of the South, writes clearly and concisely about the spiritual foundation that upholds our worship throughout the church year. Alexander further gives the reader both practical and religious information about celebrating major feasts days of the Episcopal Church and the Daily Office. As a verger in the Episcopal Church since 1999 and a seminary graduate (MTS degree), I totally appreciate Alexander's book which reminded me that one should never miss the opportunity to keep learning especially when a know-it-all complacency settles over the brain like a fog. writes Alexander in his introduction. This is good practical advice to vergers and all planners of liturgy and reminds us to continue to read, mark, learn and inwardly digest the ways and the whys in which we celebrate God's word. In the yearly liturgical cycle of the church season, we give thanksgiving and praise to God for our blessings of our life. He says that all forms of prayer—lamentation, intercession, confession, offering, pleading—spring from "the rich matrix of thanksgiving." The principal day that shapes liturgical time is Sunday. Alexander says, "All other patterns of liturgical time are overlays of this primal shape. "3 So, the importance of prayer which marks God's work in time coupled with the significance of Sunday which is the feast day that shapes the way we participate in sacred time is the major theme of the book. In the above I have given a large amount of space to the spiritual underpinnings of our liturgical calendar. But Alexander takes us through each principal feast day giving us both its history and liturgical importance. I'll use Epiphany as an example. He reminds us that the Feast of the Epiphany is a much older feast than Christmas. Epiphany dates from around the third century while Christmas seems to emerge at the beginning of the sixth century. Epiphany weaves together the baptism of Jesus, the miracle at the wedding in Cana, and the star that guided the Magi. Alexander reminds us that Epiphany is not to be thought of as the end of Christmas; Epiphany looks forward toward the beginnings of things to come. That the church's prayer has become our own is, perhaps a good way to end this review. I found Celebrating Liturgical Time informative and compelling. It is a book that should be in the church library as well as on the verger's bookshelf. It will help us avoid answering "because that's the way we've always done it" when asked why we do such and such a certain way. It will also guide us when we think about perhaps changing the way we worship on a particular church feast day by giving us a framework on which to build. Celebrating Liturgical Time manages to be both scholarly as well as accessible — a rare feat for theological writing. I am personally excited that Bp. Alexander will be presenting a lecture on his book at the 2017 Annual Conference of the Vergers Guild of the Episcopal Church in Atlanta on Saturday, October 14, 2017 at both 1pm and 2:45pm. 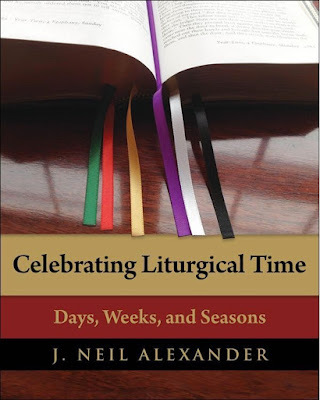 Abstract: David Deutsch, Verger at St. Mark's Episcopal Church, Washington, DC presents a book review of "Celebrating Liturgical Time: Days, Weeks, and Seasons" by J. Neil Alexander, Dean Sewanee School of Theology, and the retired Ninth Bishop of the Diocese of Atlanta. Deutsch states that Bp. Alexander "...writes clearly and concisely about the spiritual foundation that upholds our worship throughout the church year. He further gives the reader both practical and religious information about celebrating major feasts days of the Episcopal Church and the Daily Office." Deutsch concludes that, "Celebrating Liturgical Time manages to be both scholarly as well as accessible — a rare feat for theological writing."